Curators with the 9/11 memorial museum in Manhattan are fighting back following a federal lawsuit filed by an atheist group in an attempt to have a steel beam cross removed from the facility over claims that it makes them mentally ill.
David Silverman, the president of American Atheists, says that while museum directors have a right to chronicle the 2001 attack, the cross is inappropriate because it only relates to Christians. Silverman also states that the cross poses a problem because it is stationed on public land. The lawsuit claims that the cross has caused individuals to suffer “depression, headaches, anxiety, and mental pain and anguish,” and even indigestion. Last week, attorneys for the museum filed a motion in federal court asking the judge to throw out the case. 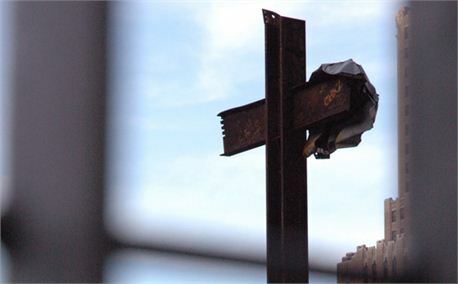 The cross at issue is a portion of steel beam that remained standing when the Twin Towers collapsed during the 2001 attacks on the World Trade Center. The beam was in the shape of a cross that stood high amidst the rubble, which served as a symbol of hope and inspiration for many. The cross, which is on display at the 9/11 memorial museum, is one of over 1,000 artifacts, photos, videos and other pieces that can be viewed daily by members of the general public.